HONOLULU, Hawaii, December 20, 2011 (ENS) – Debris from the tsunami that devastated Japan on March 11 could reach the Hawaiian islands as early as this winter, according to scientists with the National Oceanic and Atmospheric Administration, NOAA. But they say there is still uncertainty over exactly what is still floating, where it is located, where it will go, and when it will arrive. Projections of where this debris might head have been made by Nikolai Maximenko and Jan Hafner at the University of Hawaii at Manoa’s International Pacific Research Center. Maximenko has developed a model based on the behavior of drifting buoys deployed over years in the ocean for scientific purposes. These scientists predict that the debris first spreads out eastward from the Japan coast in the North Pacific Subtropical Gyre. In a year, the Northwestern Hawaiian Islands Marine National Monument will see pieces washing up on its shores; in two years, the remaining Hawaiian islands will see some effects; in three years, the plume will reach the U.S. West Coast, dumping debris on Californian beaches and the beaches of British Columbia, Alaska, and Baja California. In five years, Hawaii shores can expect to see another barrage of debris that is stronger and longer-lasting than the first one. 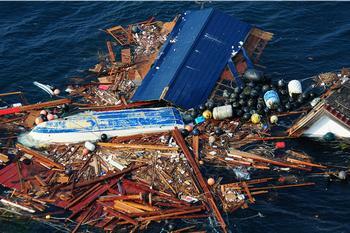 Much of the debris leaving the North Pacific Garbage Patch ends up on Hawaii’s reefs and beaches. NOAA and its partners are coordinating an interagency assessment and response plan to address the wide range of potential scenarios and threats posed by the debris. “We’re preparing for the best and worst case scenarios – and everything in between,” says Nancy Wallace, director for NOAA’s Marine Debris Program. As the tsunami surge receded, it washed boats, pieces of smashed buildings, appliances, and plastic, metal, and rubber objects of all shapes and sizes into the water. The refuse formed large debris fields captured by satellite imagery and aerial photos of the coastal waters. NOAA is coordinating new interagency reporting and monitoring efforts that will provide critical information on the location of the marine debris generated by the tsunami. Ships can now report significant at-sea debris sightings and individuals or groups can request shoreline monitoring guides at MDsightings@gmail.com. Conditions in the ocean constantly change, and items can sink, break down, and disperse across a huge area. Because it is not known what remains in the water column nor where, scientists cannot determine with certainty if any debris will wash ashore. In the worst case scenario, boats and unmanageable concentrations of other heavy objects could wash ashore in sensitive areas, damage coral reefs, or interfere with navigation in Hawaii and along the U.S. west coast. 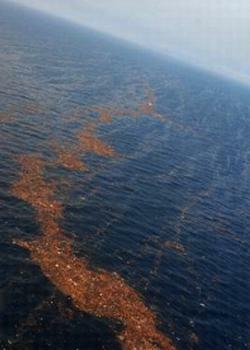 In the best case scenario, the debris will break up, disperse and eventually degrade, sparing coastal areas. NOAA has convened experts to review available data and information from models and provide their perspectives on debris fate and transport. They are gathering information through NOAA’s Office of Marine and Aviation Operation’s Pacific fleet, the NOAA Voluntary Observing Ship Program, which includes industry long-haul transport vessels, as well as the NOAA Pacific Island Regional Observer Program and their work with the Hawaii longline fishing industry. NOAA is also working with the U.S. Fish and Wildlife Service and the State of Hawaii on shoreline debris monitoring in the Papahānaumokuākea Monument.